I love this post. You getting reaquainted with yourself one sense at a time, preceiving something physical like your own reflection or the taste and feel of chocolate, piece by piece. An exquisite reawakening of yourself… beautiful! Thanks for being bold enough to share the experience. Like the time I returned from Europe after a month and my apartment felt so odd. All my stuff seemed weird to see and I felt like a fish out of water. Very insightful, thanks for sharing. Did Charlie, Chloe and Eli go up with you? How are they taking the adjustment back to “town”? doesn’t sound vain at all. i just hoped you smiled when you saw you. every mirror i pass makes me smile. Months without a mirror is a weird phenomenon which few people get to experience. So love the hand written posts. Shreve, here’s the real question, and it’s perhaps one you can’t answer yet. Assuming nothing gets in the way of it, are you going to live on the mountain next summer? BethK ~ That is SO cool to hear!! Thanks for the words, all…. Mirrors can also be a persons nemesis. Some folks feel the need to constantly check for food in the teeth, a hair out of place, lipstick smears, pimples ready to pick, boogers in the nose, bags under the eye’s etc..I wonder what we would ‘SEE’ ourselves as if we actually had no mirrors at all…What a strange concept that would be! 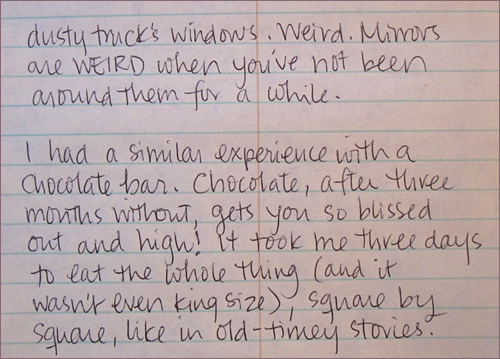 What a great story…reacquaintance is always weird but chocolate to the rescue ! Whoa. 3 months w/o chocolate. That’s one of the food groups and is needed in the diet. How you could make one candy bar last 3 days – well, that’s self control. But I bet it was the BEST candy bar ever. Also, a funny thing about mirrors. They aren’t actually reflecting the real you. They are reflecting the “mirror image”. So everything is actually backwards. I have a slight asymetrical face, which is why when I see myself in photographs, I am a little weirded out. It’s probably why many people don’t like seeing themselves in photos. They just aren’t used to seeing the Real Them. Imagine a world with no mirrors, like the old days, when all you had was a reflection of yourself in a pond of water. Like Narcissis who couldnt stop staring at himself in the water….bizzaar…but kinda neat. Wonderful perspective from an experience most of us won’t have. I love your insight, Shreve. Yeah, if I looked like you I would be looking in the mirror all the time.